THE Fast Orange range of waterless hand cleaners from Permatex is now available as a premium quality wipe. 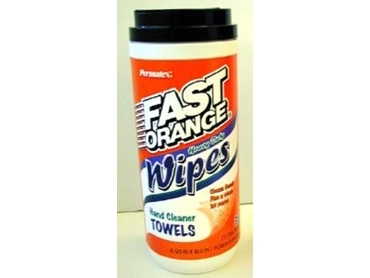 Previously available in 3.78 litre plunger-style dispensers and 443ml long-neck bottles, the release of Fast Orange wipes follows the launch of the Fast Orange bar-soap. The dual-textured wipe towels are impregnated with a powerful cleaning formula that provides a fresh orange fragrance with the cleaning performance of Fast Orange. Available in either a 25, 30 or 72-wipe ‘pull-out’ plastic dispenser, the pre-moistened heavy-duty towels are strong and will cut through tough jobs without falling apart. One side of each wipe is textured and is especially formulated for working on removing tough grease and grime. The other side is smooth and great for general purpose cleaning jobs. The Fast Orange citrus cleaning formula removes grease, grime, ink, paint, resin, glue, and other difficult to remove stains and soils. The wipes are waterless and require no rinsing making them a convenient cleaning product. Permatex has also released a range of disposable latex and nitrile gloves ideal for general automotive and industrial maintenance work. Available in three sizes, the gloves fit either hand and are lightly powdered to make them easy to put on and take off. Pack sizes consist of 10, 50 or 100 gloves catering for both retail and trade environments. The gloves - which provide comfortable, all-purpose hand and skin protection - feature textured fingers which makes them suitable for gripping dirty parts and tools.